“26 June 2017 will be seen as another red-letter day in the Tagore Centre’s illustrious calendar of events. On this day, an audience of forty people saw a unique union between a young lady – just beyond her teens, singing in her own style to capture their hearts – coupled together with an experienced and talented musician who already stole their hearts years ago. Priyanka Das, the newcomer, born 5,000 miles away from her ancestral home in Bengal, sang Bengali lyrics across Nazrul, Rabindrasangeet and other genres with immaculate precision in her melodies. That’s no mean feat to achieve at such a tender age, which will make not only her parents but also the entire audience proud of her endevours. A glorious future is certainly looming ahead of her. 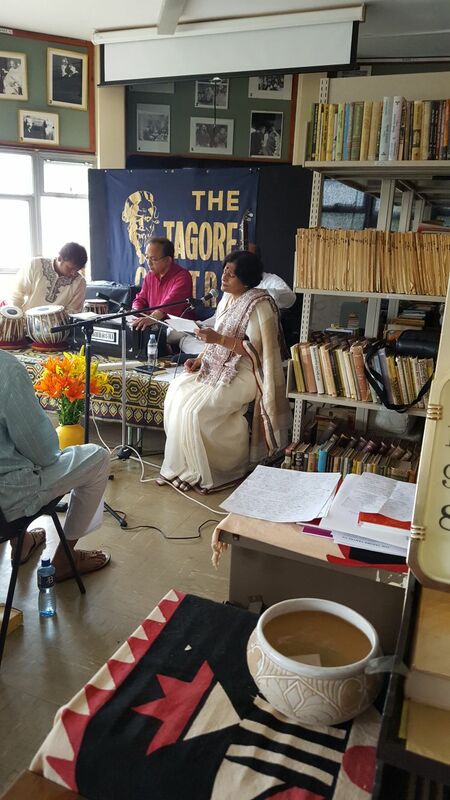 She was followed by the experienced Mamata Lahiri, whose music undoubtedly mesmerised the whole Centre, as her elegant finely-honed voice, through a series of diverse songs, transported everyone present to a mystical fairyland across the patchy clouds through the blue horizon. As she finished, the audience, back to their senses, rose to their feet with thunderous applause. These Sunday events are our most natural and holistic way of promoting the work of Tagore and Bengali culture to all audiences. Our performances are for everyone, and most of our discussions, presentations and talkes are held in English. They are free for members and we only ask for a small donation from non-members. We would of course love to tour our Sunday events across the UK, but at present they are being held in North London so we appreciate not everyone is able to get to them. For details of our events, please see our events section.